Yusupov dynasty belongs to the one of the ancient ones of Russia. Its roots ascend to rulers of Nogaisky Horde. At the time of Ivan Grozny, the Yusupov were approached to the throne and in consequence they occupied a considerable position in Russian State. Prince Nikolai Borisovich Yusupov the Elder was the magnate of Catherine’s time, the political statesmen. He was personally acquainted with Diderot, Voltaire and with a many European Monarchs. The Prince was the real expert and lover of the art. In his famous collection there are works of such painters as Van Dake, Busher, T’epolo… and more. The Yusupov’s palace on the Moika. Arch. J.-B.Vallin de la Monthe, 1760’s, A.Mikhailov, 1830 s.
A grandson of Yusupov the Elder Yusupov the Younger as if going on the family tradition, has showed his talent in many fields of a creative activity. 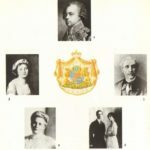 Musical compositions of Yusupov the Younger, such as sonatas, symphonies, and nocturnes sounded not only on the Petersburg scenes but also in Europe. In literature he has created many critical literature notes and romantic story «The Love of a Young Woman». A grandson of Yusupov the Younger the Prince Felix Yusupov has left his name in the Russian history as he took part in the conspiracy against Grigory Rasputin which was a favorite of the czar’s family. 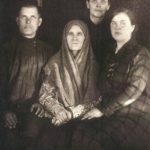 Woman of the Yusupov dynasty are famous too. 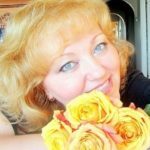 Pincesses Yusupov had a good education, they possessed a wonderful beauty. The famous painters L.-E. Dubua, V.Serov, etc. painted their portraits. Among the numerous architectonic monuments of St.Petersburg the Yusupov Palace is a permanent interest. This interest is connected not only with the architectonic exceptionality of monument. 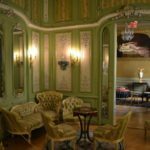 The Palace is an original ensemble of interiors that reflected the architectonic predilections of Petersburg’s elite at the extend of the century. 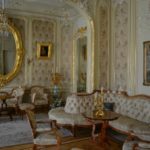 The history of Yusupov Palace connected closely both with the history of St.Petersburg and with fates of famous men of Russian history too. Rome hall, Preciosa. Arch. A.Mikhailov, 1830’s, A.Stepanov, 1890’s. The beginning of Palace’s history ascend to that period of construction of the St.Petersburg when Russia has been firmly settling down on the Baltic banks. 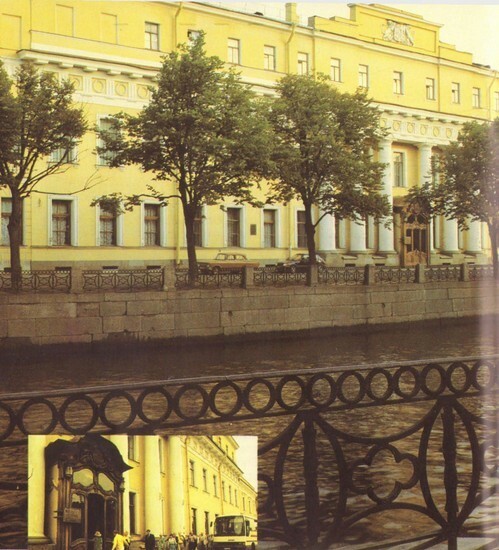 It was rare when the houses belonged to a same family name at the extend of Russian history and the house on the Moika Embankment is not the exception too. For some time the House has been belonged to Countess Branitskoi being a niece of Prince Potyomkin and the favorite freiline of Catherine II. 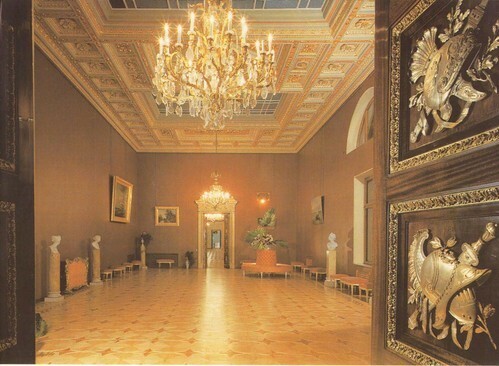 Since 1830 the Palace was belonged to Prince Yusupov. 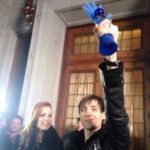 According to the taste of new owner namely Prince Yusupov the Older, the building was reconstructed by architect A.Mikhailov. Actually he has created a new whole manor ensemble. He has added the two one-storied wings to the right and to the left at the building, erected garden houses and a number of yard-houses. 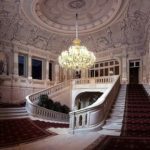 He has created an excellent entrance hall with the marble staircase in place of a thoroughfare. Anew finished lingering facade of building is treated in a tranquil neutral character. The facade is like to be subjected to an uniform rhythm of the building attached to red line. 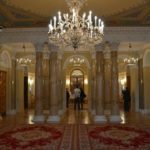 The main entrance is emphasized with Toskanien columns, and on the attic there is the Prince Yusupov Emblem of plaster work. 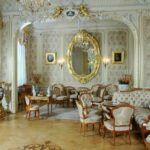 A sguite principle of disposition of internal rooms which is traditional for private residences, is typical for Yusupov Palace too. The suite consist of six ceremonial halls, reception-rooms and extends along the main facade overlooking the Moika Embankment. A finishing of ceremonial halls was carried out by famous art- decorators such as A.Vigi, V.Medici, P.Scotti, F.Torichelli, and A.Travin. 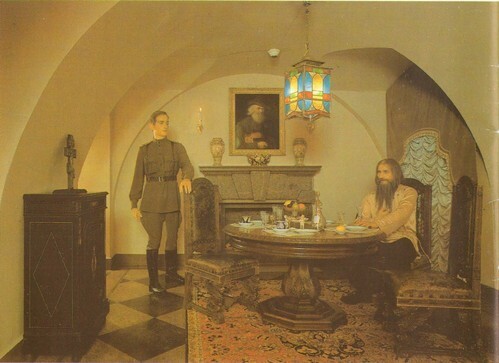 Exposition «Grigory Rasputin pages of life and death» Art V.Volkovoy, A.Lunin, 1991. 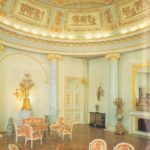 The picturesque ceilings of Big Rotonda, Red reception-room and Blue reception-room are beautiful examples of decorate painting of the first half of XIX century. Venetian mirrors, glittering lustre’s, streaming silks, trellis, an exceptional furniture all these are the complement to the fine finishing of Place’s rooms. 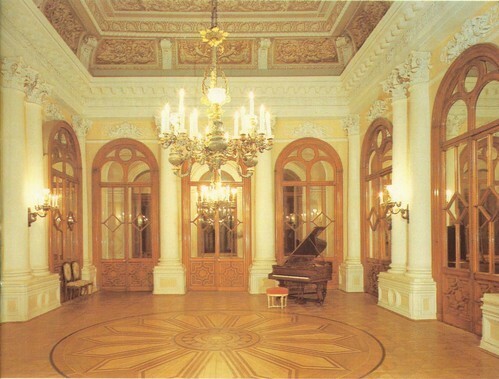 An exquisite simplicity of Dancing hall finished with a false marble contrasts both with the rich of White-column hall and with its Corinfski columns and also with complicated decorating furniture made on the traditions of Russian Empire. In the east wing of the Palace there are five exhibition halls as a quite. They are destined for art collections. The theater encloses the quite. 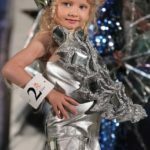 Its hall holds one hundred eighty spectators. Russian and foreign actors, vocalists sparkled with their talents in Yusupov Theatre. To the Theatre related such personalities as A. Dargomyzhsliy, M. Glinka, E. Napravnik, L. Minkus, F. List, F. Chaliapin, and F. Chopin. The construction history of the Palace is continued. New needs of owners and a changes of fashion make to reconstruct the old interiors and create the new ones. Most significant changes of the Palace building have been carried out by Monigetti. Prince Nikolai Yusupov the Younger engaged his to the works in 1857. The mid-XIX century is the time of the prosperity of the eclectic method in an architecture. Therefore, the entrance hall and the ceremonial staircase have got a new look. 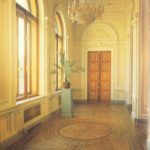 Turkish Cabinet, Pompey, Oak room, Reception-room of Henry II and Music reception-room were projected Monigetti in the spirit of historical style. 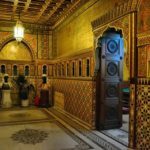 Exotic Moresque reception-room has being a splendid decoration for the Palace. The theater was subjected to reconstruction too. 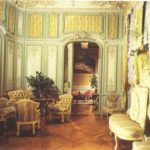 In the 1860’s Hippolyte Monigetti shaped it into a fanciful rococo, leaving unaltered its architectural volumes. In 1899 Alexander Stepanov improved the design of the predecessor. He enriched the decorations of the Theatre hall with a gilt stucco molding but painter Earnest Lipgart painted the picturesque ceiling and medallions of first circle with a beautiful painting. 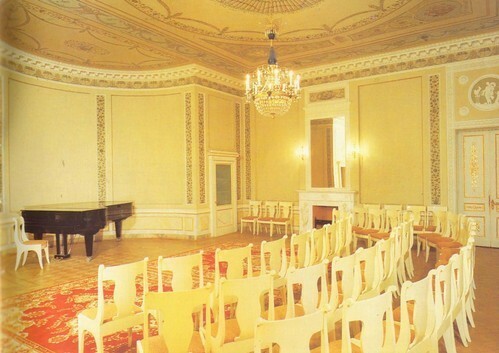 Chekhonin’s reception-room. Arch. A.Vaitens, Art. S.Chekhonin, V. Konashevich, 1910. 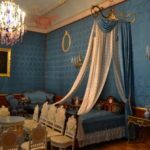 With big fantasy and mastership the architect I.Monigetti finished Princes boudoirs in the 1850’s, as well as due to the stylizing skill of A.Stepanov living parts was rebuilt in 1890’s in style of fanciful rococo. 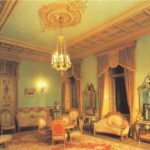 So the interior of Yusupov Palace has been quite agreed with the style which predominated at that the time namely it was a combination of the imposing with the intimacy and camberty. 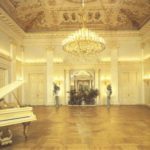 According to the order of Yusupov the Younger, which was known music-lover and the patron of the arts, Monigetti has created an exquisite interior of Music reception-room for carrying out camber and home parties. 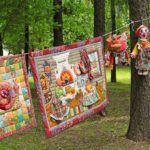 The concert programs that sound in Music reception-room today, continue the theater and musical traditions of the one of most cultivated families of Russia. 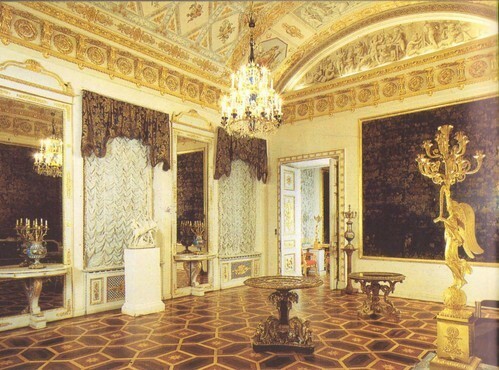 In the 1910s a part of the rooms on first floor have been decorated in the spirit of the Russian Classicism. By the architects Beloborodov, Vaitnes and the painters Konashevich, Tirsa, Chekhonin. Since that time the Palace was not subjected to the reconstruction and today it is the same it was nearly hundred years ago. 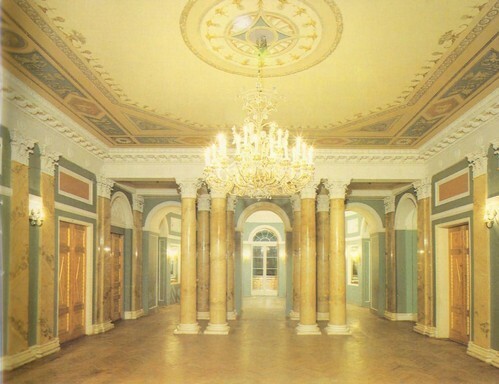 After the revolution the history of the Yusupov’s Palace was developed safely. On February 22th, 1919, Lunacharsky signed a decree which declared the Palace as the national property. 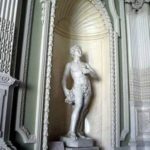 Yusupov Palace has been transformed into a museum of noble life. In the 1919 — 1926s the famous Yusupov collection was exhibited here. In the mid-1920s it was passed into the National Museum and Book Fund but a some its part was sent to the Archangelsk manor. During the tragic years of the World War II and the blockade, the Palace shared the hard destiny of the city, starved and hurt by cannon fire and bombs. After the War, restoration works had begun in the Palace, and by 1955 were already completed. Today the Palace is visited daily by a numerous people. 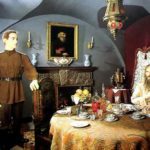 They can walk through the ceremonial halls and drawing-rooms together with a guide and also sea wax figures restoring the events connected with the attempt on Gregory Rasputin. 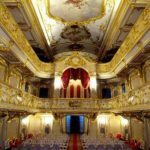 Music-lovers have the possibility to hear the concerts of Russian and European classical music that sound in antique halls of the Palace at evening parties. Little glazed corridor. Arch. A.Stepanov, 1890’s. 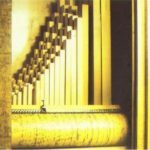 Mechanical organ. Vienna, Tomas Gess, mid-19th c.
Porcelain boudoir. Arch. I.Monigetti, 1860, A.Stepanov, 1890’s. 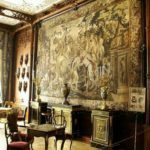 Reception-room of Henry II. Arch. I.Monigetti, 1860, A.Stepanov, 1890’s.